“Sorry officer, I didn’t know!” Our short NSW holiday over the Christmas break was soured by a U turn at a set of traffic lights (fine $263). Yes, it is legal in Victoria but we now know it is not legal in NSW! We should have read the rules BEFORE we drove into NSW. We don’t want to employ staff who say the same thing about our policies and procedures. While “I forgot” is annoying, having a staff member say “I didn’t know” is becoming a greater risk to business. Because our policies and procedures are increasing in number and importance we need a simple way to make sure our staff have access to and know about our policies and procedures. The Dental Board of Australia (AHPRA), Fairwork Australia, and Work safe seem to have a similar outlook to that NSW traffic cop and there is little tolerance of ignorance. Helping the small business comply with the ever-increasing demands is best done by SmartDentist! Our clever content management system allows employees immediate access to every new policy and Smartdentist has communication systems to allow you to easily communicate policies to employees. “Smart” employers can keep track of staff signoff and be comforted knowing that staff have access to policies 24/7. What better way to have a feedback loop online so changes can be made ASAP. Check if policies need to be reviewed and update (use bulk update or update individual policies). Check any additional template policies available in our Policy library. Have you considered the new policies for your Human Resources Manual? There are over 60 policies for you to consider from our template library. You don’t need to let future policy additions stop you from gaining employee signoff and acknowledgement right now. Be relaxed in knowing that at any time in the future you can email a new policy directly to every employee and then checkout signoff for that individual policy. You can also checkout when your staff have logged into SmartDentist. The best time to get employee’s to signoff, that they have read and understood policies, is when they are first employed. Use the New Staff Induction Checklist (HR > New Staff Induction) and you will find a link to PRINT all policies. You could print to paper or print to pdf and email all policies or a selection of policies (e.g. infection control manual or human resources manual), to the new staff member. 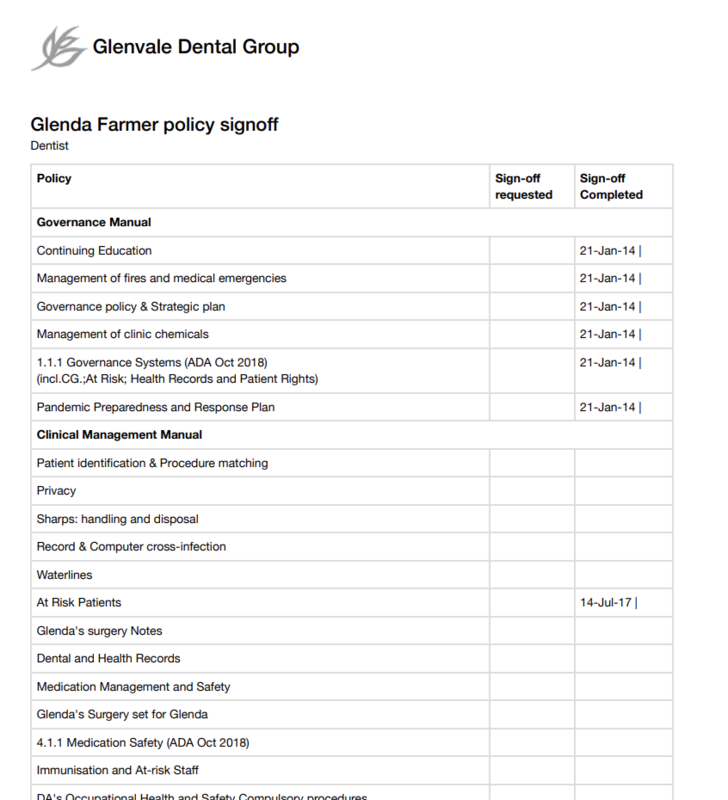 We also recommend you print off the “Manage Policy Signoff Requests” page for an individual and use it as a hard copy to save in a staff member’s employment file. Start the new year with the following process. b. standards of accreditation and compliance mean there is a greater need for staff to help make sure our policies and procedures are correct and correctly followed. Let staff members know that further details will follow and they will be asked to signoff to say they have read and understood each policy. Ask staff members to make sure they can login to SmartDentist. Suggest that they save their password in their mobile phone under NOTES in the practices Contact details. One of the biggest time waster and sources of frustration is a staff member who can not login. Make sure staff members know they are not to login under someone else’s login and that you can not log on if someone else is already logged on in the one browser on your computer. Get ready to help staff with your request for signoff. c. Place these in a folder somewhere that staff can access them. Send another email asking staff to signoff on every policy explaining the location of the printed signoff and policy and procedure manual at work (so they can read and signoff without a computer being free) and that they need to have both Smartdentist and their personal signoff sheet completed. e.g. they need to get familiar with login to Smartdentist to access policies and procedures. The “All Staff Signoff page” gives a quick overview so you can see how everyone is progressing. As the administrator of Smartdentist you can also see when a staff member logged into Smartdentist and how frequently (HR> Staff profile). If they logged in and logged out you can also see the time they spent. Make sure you follow-up each individual. If a staff member refuses to signoff on a policy then it is important to have a calm and rational discussion about why they wont signoff. It is best to ask for this in writing BEFORE you address their concerns as it will allow you time to consider their viewpoint. Sometimes there is a mistaken belief by staff members that if they don’t signoff then they don’t need to do what the policy says. This is incorrect. You can not force a staff member to signoff a policy. You can performance manage a staff member who refuses to do what your policy requires. Login to SmartDentist and check out the “Steriliser Documents and Monitoring Policy”, or if you aren’t part of SmartDentist look at the ADA guidelines for Infection Control P28 (and P20). How do you improve the efficiency of your document storage and collection? Establish a routine. Doing the same thing for every instrument is most efficient although it isn’t required. If staff don’t need to work out separate processes for different instruments the time saving is immense. Sterilisation log book -(our practice has a sterilisation log page). All tests are recorded within the one sheet. Our packs are labeled with a date and cycle self-inking stamp; and so it out sterilisation log page. The sterilisation log page can be scanned onto the computer (make sure it is located somewhere so it is saved for 7 years e.g. into patient computer software is ideal) for storage or a photo can be taken and the image stored. See SmartDentist’s Reference and document links page to download a sample Sterilisation log page as this might help you with your own system. SmartDentist also has a “What tests do I need for my steriliser?” aid. See RESOURCES. Many dentists and staff get quite confused about the rules for infection control. The Dental Board is the government regulator of dentistry and they say that dental practices should use 3 documents to guide their infection control procedures. The Australian Standard for reprocessing instruments (e.g how you clean and sterilize instruments) . Unless you are a hospital you will use AS 4815. An alternative standarad is a new version of AS 4187. This is a very very hard standard to meet so just ignore it for now. SmartDentist subscribers have access to AS 4185 via their login. It is 97 pages long and was finished in 2006. Australian Guidelines for the Prevention and Control of Infection in Healthcare published by the National Health and Medical Research Council (NHMRC). This document is available online and was finished in 2010 and is 262 pages long. ADA guidelines for infection control. This has just been revised and is about 50 pages long. So why have 3 documents, and why don’t they just tell us what to do? Each document is different. Yes, sometimes they can be interpreted to be in conflict or at least not clear about requirements. The easiest document to read and understand is the ADA guidelines. ABOUT THE ADA GUIDELINES: Because the ADA is an organisation of dentists it is easy to understand that a government regulator would not be happy in just letting dentists decide on their own standards. Similarly the ADA looked at the other 2 documents which have wide ranging membership and tried to be practical and sensible in what it says dentists should do and use out of those other documents. These documents are the source to go to if you are in dispute about what should be done in your practice. You DON’T really want people to tell you exactly what to do because they don’t work in your building, with your equipment, with your staff or know exactly how your workplace functions. For example; in a big hospital do you need a first-aid kit when staff have access to emergency hospital care; do you need a designated spill kit for large spills of blood in a suburban dental clinic. *When a sales person say…the ADA now requires you to ‘x’ then ask them to show you in the ADA guidelines before you buy their sales item. The ADA is not the government or controling body of dentists. They are a voluntary organisation. NHMRC guidelines for an overview of concepts and information apon which to base a decision. AS 4815 on technical requirements for sterilising and record keeping – just remember that it is nearly 20 years old and some things weren’t even invented e.g. USB sticks instead of printers. So stated an offical letter to all NSW Dentists. Not withstanding the proviso that it only applied to NSW Dentists who have an open complaint, it is a good idea to work through the directives from Dental Council of NSW and see that you have everything in order. One of the requirements is a completed DBA Infection Control Guideline Self-Audit. Check out how SmartDentist answers the audit. DBA Infection Control Guideline Self-Audit by SmartDentist. Sterilizer (autoclave) log sheet to use for your logbook. Disaster recovery worst practice: Don’t test your backups. Tomorrow I go into the clinic just to meet our IT specialist and we are going to do a backup recovery of our patient management software. Similarly the DBA self-audit does take a bit of thinking and time – but helps get rid of that uncomfortable feeling we would all have, if we were queered by the Board. Whether you are in NSW or another state…do the self-audit and smile.